We’re pretty pumped about the BOY/BYE project and so should you! Featuring a product line of pins, prints, stickers and patches all showcasing women of color, the BOY/BYE project is a lighthearted expression of solidarity with women who don’t often see themselves in the stories presented to them. MuslimGirl had the honor of talking with the young Muslim illustrator who began the project, Sara Alfageeh, to learn more about the BOY/BYE campaign. Sara: My name is Sara Alfageeh, I’m the illustrator and co-director behind the BOY/BYE project. I’m Boston born and raised, and a proud immigrant kid of two Jordanian parents! I’m a giant nerd who likes to cook, play video games and read depressing autobiographies. What motivated you to begin the BOY/BYE campaign? I combined forces with my co-director, Abbas Rattani (creator of #MIPSTERZ) for one main reason: making rad stuff representative of us. All the women we know in our lives are dope and confident in who they are, and unapologetically themselves. We were inspired and motivated by this and so we wanted to create images for the world to see and art that feels representative of them. BOY/BYE is our way of projecting these voices. What are some of your products and what is the inspiration behind them? I have to also give a huge shout out to Nancy Marcel, a good friend and fellow illustrator. 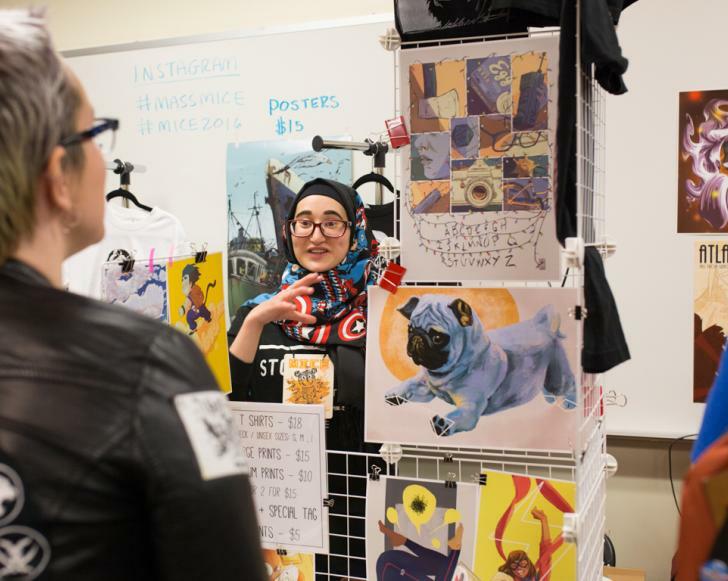 I was lucky enough to help debut her “Hijabitches” sticker set at Massachusetts Independent Comics Expo earlier this year. That series took the boldness of hijabi women and presented them in a defiant way, and the real power of a dismissive attitude. I pushed me to explore similar concepts and do for other girls what those stickers did for me. The enamel pins were our main focus. My challenge was to come up with something that looked cohesive, but letting each design stand out in their own distinct way. We actually had about 20 different designs, but had to narrow them down for production. We then continued to refine them until we had something we were proud of. We annoyed so many of our friends during this process trying to find out what designs to go with, it was a team effort. Added bonuses were our HD wallpaper for our $2 pledge tier, and our BOY/BYE patches for our bigger donors, for folks to rep the BOY/BYE attitude wherever they go. Tell us a little more about your collaboration with MIPSTERZ! My co-director for this project is Abbas Rattani, creator of the non-profit group #MIPSTERZ. It was a bit of accidental activism. #MIPSTERZ do regular community events that I can only describe as a Tedx Talk meets an art gallery meets a house party. I got invited to speak at one of these events, and in typical form, the venue was packed beyond what the fire code probably allowed. These spaces for people of color are clearly needed. Being allowed to be yourself is a privilege not often given to immigrant kids, PoC, and those who are visibly part of minority identities. This is a central goal of #MIPSTERZ — to create communities and spaces where folks of all backgrounds can get together and just be themselves and express who they are unapologetically and be uninhibited in their enthusiasm. After that event — that’s when Abbas and I got to working. Where will all the proceeds be going? Proceeds will be going directly to funding #MIPSTERZ programs — where we’re carving out accessible spaces for artists of color, and providing much needed mentorship to aspiring artists. This also involves investing in equipment, tools, and folks! We’re aiming for more ambitious projects and community engagement around arts, culture and social justice. But, first and foremost, we will be shipping out all the BOY/BYE donation rewards! And, if we reach our stretch goals, we unlock a new enamel pin design, and the entire series line will be made available online for a limited time. This is our thank you for your support. What is the future of the Boy/Bye series after your kickstarter project? This is just the beginning. If we reach our stretch goals, we look forward to bringing BOY/BYE to an online shop and to conventions. We are also looking forward to doing a follow-up project! We learned a lot from this process, so it might not be an exact extension, but the ideals and goals of the project will continue. Like I mentioned before, we had dozens of designs initially and had to narrow them down for efficient crowdfunding and production. We recognize that we barely scraped the surface with this project, there is so many other identities and narratives we can celebrate and explore — especially through collaboration. There aren’t many illustrators featuring women of color. What are some of your ideas on increasing artists in this space? I disagree. I think there are plenty of artists, I just don’t think they’re getting access to the platforms they need. We can only have a diverse set of stories by allowing those creators the room to do so. It’s a responsibility on those in the industry to help make that space. The purpose of being an ally isn’t to speak over or for a marginalized group, but to help project their voices. On the other hand, social media, crowdfunding and YouTube have changed the game. What’s incredible is now that creators can access audiences directly and make their own platforms, not through publishers or networks that are the traditional gatekeepers to the media we consume. However, we still have a problem with extra noise, and as the internet gets better at connecting people, soon people will be able to access audiences more efficiently. If you want it done right, find some friends and get to work. How can we help out with the campaign and beyond? Kickstarter is all or nothing, making the goal is the only way to get BOY/BYE going. Pledging will be the only way we can get the stickers, pins, prints and patches to you! Sharing on social media is also essential. If you dig it, help us get the word out by posting/sharing/retweeting the campaign. We are so grateful for all types of support for the project, and can’t wait to share it all with you! Stay connected via #MIPSTERZ and come out to some our events in the future! You can keep up with our projects and the Kickstarter by following us on Twitter at @TheFoofinator and @AbbasRattani. You can check out more of Sara’s art on Behance.net/artbyalfa, and check out what #MIPSTERZ has been doing on Mipsterz Facebook page. I find that the most important point of this movement is empowering women of colour through their artwork by providing a space for them to promote their work and thrive. I think that creating a space where women of colour can freely express their views through their art work is so important in moving towards the social change of breaking stereotypes. This is due to the importance of self expression, through artwork, which is a foundation of social change because once minorities are able to present themselves in a manner that best reflects them individually, stereotypes can begin to diminish because there is a unique sense of self within different races, genders, religions, etc. I think this is best reflected in the interview when Sara says ‘the inspiration of the boy/bye series includes women of colour as we know them: unapologetic, assertive and in solidarity” because it destroys these ideas of women of colour being submissive and quiet. Another important point I found in the interview was how Sara talked about what it really means to be an ally. Too often the definition of an ally gets messy and many people think it means to speak for minorities rather than help them speak for themselves and share their own views. I find that it is especially important to get this definition of an ally clear and straightforward so that within social movements allys of privilege know where they stand and how they should be standing to help out people who may not be in the same position of opportunity of them.